Route 66 Casino is your hot spot for fun and excitement, offering the best gaming, finest dining and the hottest live entertainment in all of New Mexico. Mission: Get Your Kicks at Route 66 Casino Hotel, where the entertainment sizzles and the scene is unmistakably cool! Congratulations from all of of us! Students from Artisco Heritage Academy had the opportunity to attend sound check, and a Q&A with George Thorogood & The Destroyers! Special thanks to George Thorogood and The Guitar Center Music Foundation! Congratulations to Thomas C he just won $12,500 on White Hot ! 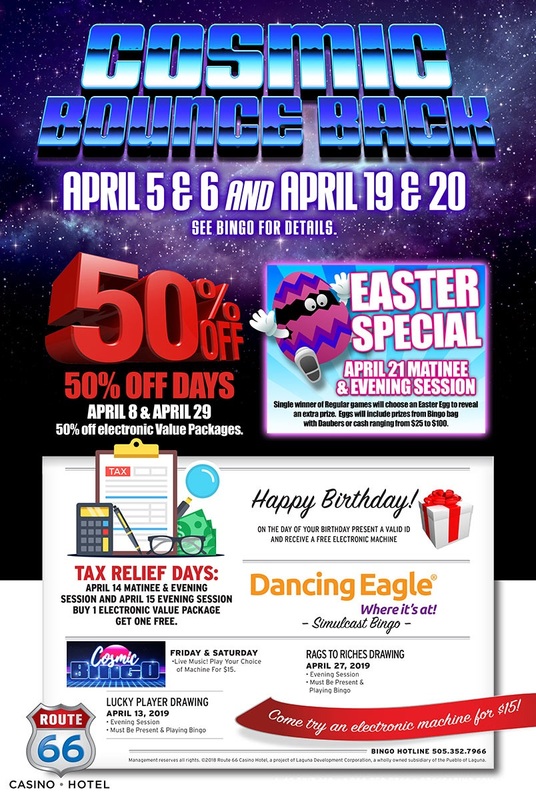 Spring into the winning this April at Route 66 Casino BINGO! Today's featured employee of the week is Nancy! You can find Nancy at the Poker Pub Bar serving up drinks; her friendly personality is what makes her a favorite among our guests. Stop by the Poker Pub Bar & say hi to our exceptional team member Nancy! To be entered to win, simply like this post & tag the person you'll be taking to the show in the comments. Winners will be randomly selected on the afternoon of Tuesday, April 2nd. Show is on Friday, April 5th. Cast your vote by spinning on the title you want to see stay. Both games are unlocked for a limited time! Buffet 66 Fresh Market just received national recognition as New Mexico's Most Indulgent Buffet!👏🏼🎉 Taste for yourself and join us for lunch or dinner! Marjorie has a late night win on Lighting Link! Congratulations from all of us! This week, we are recognizing Thunder Road employee Jose. In his four years with the company Jose's shared his favorite part of his job is the opportunity to work alongside his coworkers. Stop by Thunder Road & say hi to Jose! The $350,000 Money Madness drawings have begun! 5 contestants will be selected every hour from 5pm – 9pm Tonight! Congratulations from all of us at Route 66 Casino Hotel! Today is your FINAL day to unmask your share of cash & prizes in our $350,000 Money Madness promotion! Comedian extraordinaire Sebastian Maniscalco continues a string of record-breaking sold out comedy appearances with his #StayHungryTour. After the release of his new book (Stay Hungry) and his seriously popular radio show "The Pete and Sebastian Show" Maniscalco is bringing his award-winning comedy to Albuquerque this August! Kelly is our featured employee of the week. Over her 5 years with the company, she shared the customers are her favorite part of her job. Stop by the cage and say hi to Kelly! Thank you to everyone who joined us for a night of laughter with comedian Carrot Top! Hot Seat drawings happening TODAY hourly from noon - 8pm. Two lucky guests will be chosen via hot seat to win $100 in free play! Drawings for the $350,000 Money Madness kick off every hour from 5pm - 9pm! Unmask your share of cash and free play prizes. Celebrate St. Patrick's Day with an Irish Beef Stew served with Jalapeno Cheddar Cornbread for only $10.99 at Thunder Road! This special is available today and tomorrow 3/17. George Thorogood LIVE in #LegendsTheater 04.05.19. Music video by George Thorogood And The Destroyers performing Bad To The Bone. Happy Pie Day! Celebrate with a slice of pie at Buffet 66 Fresh Market; from blueberry to flan pie, there's something for everyone. We want to know what your favorite pie is, let us know in the comments below. Congratulations to Turbo Rewards Member Michael P! He just won $14,436 JACKPOT! Bob hit our Ultimate Fire Link for $12,310! Congratulations from all of us Route 66 Casino Hotel! We've got plenty of Bingo fun happening this week! 🍀 St. Patrick's Day FREE $500 Game plus free daubers while supplies last. This week, we are recognizing Table Games Dealer Kenneth who has been with the company for over 15 years. Kenneth's friendly positive attitude makes him a favorite among co-workers and customers. Stop by our Table Games Pit and say hi to him! School's out - why not check in for fun at Kids Quest. It's a party with the animals weekends in March. Kids will have a ball dressing up like safari animals as they take part in games, crafts, movies, and activities with a jungle-themed twist. We serve dinner from 4pm - 10pm. To show our appreciation for all our Facebook fans, we're giving away tickets to Carrot Top! Winners will be randomly selected on Tuesday, March 12th. Show is on Saturday, March 16th. Drawings every Friday in March at 9pm. Entries earned Saturday - Friday. Double entries Monday & Tuesday. What show are you most excited for? The fondest memories are made when gathered around the table with family and friends. Join us at Thunder Road, we have a table ready for you! Be the first to know and let us send you an email when Route 66 Casino Hotel posts news and promotions. Your email address will not be used for any other purpose, and you can unsubscribe at any time. Pick a ♥ for guaranteed cash every Saturday in February! Only 10 points per entry. Go Play! Thank you to everyone that joined us for our Chinese New Year celebration yesterday! May the Year of the Pig bring you success in all the spheres of life - a year of fortune and luck! Give the love of music this Valentine’s Day to your sweetheart! 💞🎶 Casino ticket presale coming up on Monday, February 4: • GEORGE THOROGOOD AND THE DESTROYERS - April 5 • SAMMY HAGAR & THE CIRCLE - April 27 • HAIRBALL - THE ULTIMATE 80's Tribute - May 3 • UB40 - August 24 Presale dates: February 4th – 7th! 🎶 Present your Turbo Rewards Card at the Route 66 Player's Club & receive a $5.00 PER TICKET discount on up to 6 tickets, avoid all ticket fees & get first choice of theater seating! Presale tickets can only be purchased at the Route 66 Player's Club (no online sales) between the hours of 9am - midnight. Tickets go on sale to the general public Friday, February 8th at 9am. Please share with family & friends! Friends - join us tonight! 😎🕺🏻🤳 We’re planning a Rock & Roll of a good time! This party promises to be a real blast with delicious dining specials, live entertainment around every corner and thrilling casino promotions! Plus Kids Quest (Albuquerque, NM) is also in on the fun with a Grease Lightning party planned for the the kids, midnight balloon drop included! Get on the horn and tell your family and friends to meet you at Route 66 Casino! We’ve got Christmas Tamales! Friday, December 21, 4pm - 9pm While supplies last! Show tickets make the perfect stocking stuffer! 🎁 🎄 🎫 Casino ticket presale coming up on Monday, 12/17: • JEFF FOXWORTHY Feb. 9 • CARROT TOP Mar. 16 • REO SPEEDWAGON June 29 • STYX Aug. 3 08/03 Presale dates: December 17th - 20th! 🎶 Present your Turbo Rewards Card at the Route 66 Player's Club & receive a $5.00 PER TICKET discount on up to 6 tickets, avoid all ticket fees & get first choice of theater seating! Presale tickets can only be purchased at the Route 66 Player's Club (no online sales) between the hours of 9am - midnight. Tickets go on sale to the general public Friday, December 21st at 9am. Please share with family & friends! 🚨CONCERT ALERT Give the gift of Legends this holiday season! 🎫🎁Casino ticket presale for JEFF FOXWORTHY 02/09, CARROT TOP 03/16, REO SPEEDWAGON 06/29 & STYX 08/03 will be happening December 17th - 20th! 🎶 Present your Turbo Rewards Card at the Route 66 Player's Club and receive a $5.00 PER TICKET discount on up to six tickets, avoid all ticket fees & get first choice of theater seating! Presale tickets can only be purchased at the Route 66 Player's Club (no online sales) between the hours of 9am - midnight. Tickets go on sale to the general public Friday, December 21st at 9am. Please share with family & friends! Saturdays in December have never been sweeter - it’s Sugarland in Chevy Land! The legendary Buffet 66 has been re-built from the ground up to create an all-encompassing, all-you-can-eat dining experience never before offered anywhere in the Land of Enchantment. Are YOU ready? We’re chasing turkeys every Saturday in November with our $200,000 Turkey Dash for Cash promotion! 🦃 🏃🏻‍♂️🏃🏻‍♂️💵 Five winners will pluck a prize every hour from 5pm - 9pm. Only 10 points per entry! Gobble till you wobble & Go Play! Join us every Saturday in October for our Monster Smash promotion! Qualifers will be drawn from 6pm - 9pm followed by a grand prize slot tournament after 9pm. Win your share of cash prizes!! $1,500,000 Birthday Blast drawings continue tomorrow, 9/22! Every hour from 5pm - 9pm 3 contestants will play for guaranteed cash prizes! 10 points earns you an entry. Celebrate our 15th Birthday Blast! Every Saturday in September, you could win $1,500,000! Every hour from 5pm-9pm 3 contests will play for guaranteed cash prizes! $400,000 Route To Riches drawings continue tonight! Every hour from 5pm - 9pm, 5 contest will spin the wheel to win their share of cash prizes! Route 66 Casino Hotel invites YOU to join us for a weekend of cool cars and hot chili! 🌶 SOUTHWEST REGIONAL CHILI COOKOFF CHAMPIONSHIP Saturday, August 4th 🌶 NEW MEXICO STATE CHILI COOKOFF CHAMPIONSHIP Sunday, August 5th 🌶 14TH ANNUAL CALENDAR CAR SHOW will feature over 200 classic & custom cars, hot rods & motorcycles. Chili tasting kits will be available for purchase all weekend. This family-friendly event will take place all weekend! We want to give YOU the ultimate vacation getaway this July with our ‘What A Trip’ promotion! You could win a trip for two, including airfare, hotel stay and spending money, to Jamaica, Rome, Rio de Janeiro or Paris! Drawings every Saturday from 4pm - 9pm. Just 10 points earns you an entry. Go Play! Want your business to be the top-listed Hotel in Albuquerque? One of the largest resources on the Internet for finding hotels and related businesses, worldwide. We will notify you when anything happens in Albuquerque.